One of the tough things about writing a recipe column for a magazine is doing things way in advance. I originally made this cake recipe in March…way before cherries graced the shelves of the supermarkets in my area. So I came up with a solution, and bought a package of cherries from the freezer aisle. Well, that’s a good solution for making this fabulous cake year round, but now that it’s summer and delicious fresh cherries are abundantly available, there’s only one way to make these properly, and it involves fresh cherries, and a handy cherry pitter sent to me by my friends over at OXO! 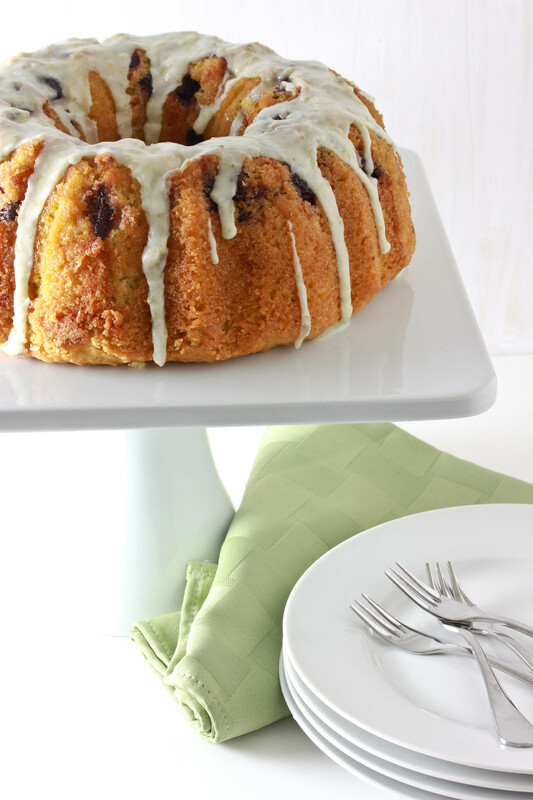 This is one of my favorite new bundt cake recipes – fresh, bright, light, and simply delicious. Try it, you’ll definitely agree! Preheat oven to 350. Grease and flour a standard bundt pan and set aside. Combine lime juice and milk in a small bowl and set aside. After a couple of minutes, the mixture will appear curdled. In the bowl of an electric mixer, beat together the oil, eggs and sugar until smooth and creamy. Add the vanilla extract, lime zest, baking soda and baking powder. Beat well to combine after each addition. Turn the mixer to low and add half the flour, then the juice and milk mixture, then the remaining flour. Beat until just combined. Pour about ¾ of the batter into the prepared bundt pan. Sprinkle the chopped cherries over the batter. Pour the remaining batter over the cherries, covering them completely. Place the cake in the preheated oven and bake at 350 for 40-45 minutes. Meanwhile, combine all glaze ingredients until smooth. Add the water, if needed, if the glaze is too thick. Drizzle the glaze over the cooled cake. Note: if you can’t find fresh cherries, or you don’t want to pit them, use frozen! Use them straight from the freezer, and toss them with half a tablespoon of flour before putting them into the cake. Gorgeous bundt with lovely flavours – must taste wonderful. Such a great summer cake! Great flavors for summer! It looks fantastic! What type of oil do I use for this cake? It’s the cherry and lime . Thanks. I use canola oil, but any flavorless oil should work. how do I make zest? Use a zester – or a box grater on the tiniest side. Awesome cake! Have made it twice and it was a big hit both times. Thanks! Hi was just wondering if this cake can be frozen? Sure can! Better to freeze without the glaze. Can I cut the sugar to 1 cup? I don’t recommend making changes to the recipe. Just made this for Shabbos and snuck a taste – delicious and summery and refreshing even if that’s possible for a cake!